'Park Hill', the William Butler Duncan Jr. estate designed by Carrere & Hastings c. 1903 in Port Washington. Duncan was a 1882 graduate of the Naval Academy at Annapolis. He served in various positions at the New York Yacht Club and was involved in numerous America's Cup races. The NYTimes lists his parents as living at 1 Fifth Avenue in New York City. The estate was purchased by Vincent Astor in 1922 and the main house demolished and replaced with a Delano & Aldrich commission. Click HERE to see the 'William Butler Duncan Papers'. Click HERE to see where 'Park Hill' stood on google earth. Do you know where in PW the house was located. Ive lived there my whole life and looked on historicmapworks.com and didnt see anything. 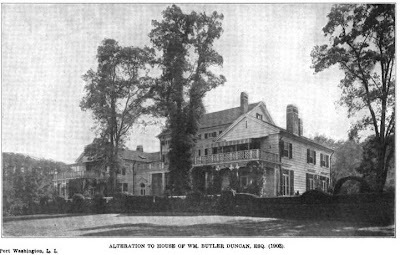 It sat on Astor Lane, if you look at the E. Belcher Hyde map from 1906 you will see W. Butler Duncan Jr. just below the Isaac Guggenheim estate, now the Village Club of Sands Point. I'm adding a link to wikimapia.